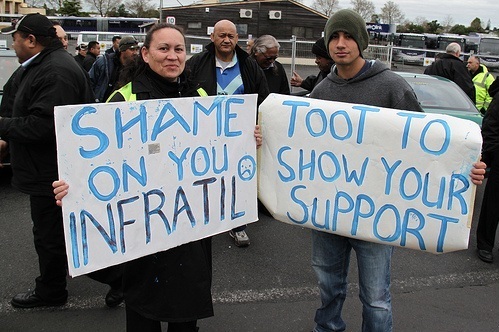 Infratil locked out their workers during the last dispute in 2009. At a mass meeting on the 17th of September Auckland bus drivers working for NZ Bus Ltd had thrown out a pay deal recommended to them by the First Union and the Tramways Union, and the drivers were set to strike on Monday, September the 24th , and every Monday thereafter. Every socialist and trade unionist should be aware of what happened next and of the full story of the bus drivers’ dispute so far, for it shows precisely what is wrong with the union movement at the moment and where hope lies. At the last minute, without consulting the membership, union officials called the strikes off and tried to foist the same basic deal on the bus drivers they had already rejected three weeks ago. The deal was put to a second vote, a secret ballot this time, which closed on Friday, October 5. The result was another rejection, confounding the unholy alliance of bus company and union officials. It is not yet known what action the two unions will take now. But the story of this dispute is still unfolding. The story begins with 900 bus workers seeking a new collective agreement with NZ Bus Ltd to run from July 2012. The bus drivers are currently paid $18.75 an hour; and they only get paid for 8 hours of a 14-hour day when on a split shift; they get time and a quarter for working on a rostered day off. The drivers want a substantial pay increase, and no wonder. NZ Bus is owned by the multi-national giant Infratil. Infratil can afford to pay up. Its profits rose by 6% to $127 million in the year to April and the company increased its dividend payout by 18%. This company feeds off what were once publicly owned services and utilities. An Auckland bus strike would give huge power to the drivers’ bargaining position. It would cause considerable disruption. Alternative arrangements would have to be made for children to get to school. People would be late for work. It was time to call in Helen Kelly, of the Council of Trade Unions, to save capitalism from this awful prospect! On September 12, before the first Monday strike was due, NZ Bus and Helen Kelly put out a joint press release to announce a proposed settlement that would be recommended by the unions to a ratification meeting of drivers on September 17. For union officials to be celebrating with the employers in advance of the ratification meeting is scandalous. It shows complete contempt for rank-and-file members. The ratification meeting on Monday, September 17, rejected the joint union recommendation and voted to implement the Monday strikes. The deal was voted down 352 to 265 according to NZ Bus, admittedly an unreliable source. The deal included an increase in the rate for working on rostered days off to time and a-half (again according to NZ Bus, therefore a health warning on this information applies). The reason the drivers rejected the proposal was the delay to the $20-an-hour rate until December 2013. This episode demonstrates just how far paid union officials can be out of touch with the ordinary union member. Of course, none of these union worthies would be struggling on $18.75 an hour themselves. Union leaders worth their salt would not recommend a lousy deal, but would be fully behind action for a living wage. What followed the rank-and-file rebellion was nothing but a conspiracy by the union bureaucrats and bus company to clamp down on the drivers’ independent spirit. With the first Monday strike looming for September 24 the union officials did another deal with NZ Bus, called off the strike and put out a joint press release with the company. The excuse for calling the action off was an improvement in the pay offer so paltry as to be almost insignificant. Instead of $20 an hour from December 2013, the rate would commence from November 2013. Unlike with the previous proposal, there wasn’t a mass meeting to discuss the barely revised deal. Instead a secret ballot was organised depot by depot. This change in the ratification process meant, of course, that there would not be a forum for any alternative viewpoint being voiced by ordinary members to the membership as a whole, and that the unity and confidence generated by a mass meeting would not occur. The arrangements were designed for voting in isolation in order to get the new version of the agreement through. According to First Union the ballot result was 51% to 49% to reject on a high turnout. It shows the drivers’ determination that despite the demoralising antics of the union officials, the second deal was thrown out. We have to wait and see whether the unions will re-instate the Monday strikes threat. There can be no doubt a great majority of drivers would abide by a strike call even though nearly half voted for the settlement. The International Socialist Organisation (ISO) stands in a political tradition that recognises that paid union officialdom is separated from the daily experiences of ordinary members and that the upper reaches are paid a lot more too. This union bureaucracy plays a role politically linked to, if only informally, the Labour Party leadership. This role is to act as mediator between workers and employers; to act within the capitalist system, not against it. Compromise is the bureaucracy’s watchword. As the bus drivers’ dispute shows, the mediation role can lead to being in cahoots with the employers against union members taking action. The ISO believes in independent, workplace-based union organisation in which representatives are elected and part of the rank and file. In practical terms that would mean in the case of the NZ Bus dispute that elected drivers themselves would conduct negotiations with the company. Our union movement has some serious weaknesses. There is low union membership, especially in the private sector. Only a small fraction of workers are covered by a collective agreement. There is a huge unmet need for union organisation to tackle low pay, poor conditions and bully-boy management. Only a fighting union movement can inspire workers to flock into the unions. The Auckland bus drivers are showing the spirit that can take the movement forward. The dead hand of paid union officialdom is part of the problem.